The Sanderson Adele range of luxury bedding is based on a late 19th century French fabric design of the same name and portrays loose bouquets of Peonies in a graceful, uncluttered arrangement. This elegant floral print, coloured in soft pink tones set against an ivory ground, is both understated and eye-catching. Of the highest quality and printed on 200 thread count cotton percale; every product within the Adele bedding range will transform your bedroom into an oasis of calm and comfort. The duvet cover has a spot reverse and is edged with a fine pink cord piping. The collection includes an oxford pillowcase, quilted bedspread, curtains and a co-ordinating flat sheet and housewife pillowcase. A beautifully soft fringed wool blanket completes the bed. This dramatic design features a bold silhouette of over-sized leaves. 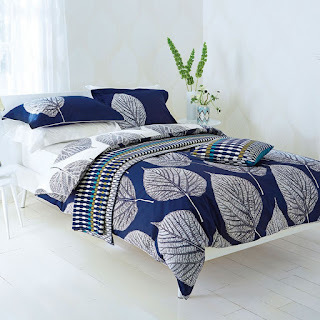 The duvet cover enjoys a positive/negative colour combination: the front is navy with a white leaf, the reverse white with a navy leaf, piped in white. The navy Oxford pillowcase has a single white leaf placed on the left hand side and a plain navy reverse, again with white piping. Both the duvet cover and pillowcase have been printed onto 180-thread count, 100% cotton percale. 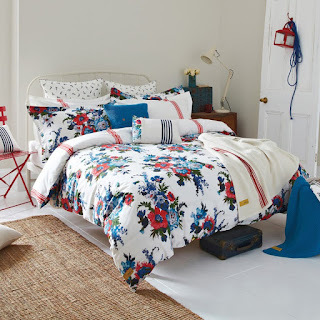 Adorned with a lovingly designed floral print, Amelie Floral features eye catching blooms in poppy red and cobalt blue, sure to give any bedroom a fresh feel. Turning back the duvet reveals a stripe reverse creating a serene balance to this punchy print. A hand drawn floral cushion with a smattering of stripes and natural wooden buttons add to the country-meets-coastal charm of this stunning design. Lace Stripe is a sophisticated stripe featuring elegant horizontal stripes of pattern, with the reverse in the Lace design of symmetrical, interlocking geometric motifs inspired by the structure of lace. The Oxford pillowcase is printed with vertical stripes and the housewife option has the all-over lace pattern. Available in two colourways, the slate version features moody shades of grey with chartreuse highlights and the raspberry alternative combines bold pinks and orange tones.